Women have myriad problems when considering a holster for concealed carry. It can be difficult enough to find a product that conceals in everyday clothing, but it can be even more difficult to find something that can be concealed in dress clothes or athletic clothes. Given that women are among the fastest growing group of shooters, it is no surprise that many enterprising women have already come up with a number of innovative solutions to the CCW issue. While many traditional holster companies do create holsters that they market to female shooters, they are typically for standard IWB or OWB, which can be challenging for women since our clothes are typically more form fitting and our hips are shaped differently than men’s. At SHOT Show 2016, there were several companies that stood out as successfully addressing the problem. A newcomer that I first saw at the NRA Show last year is Lethal Lace. Lethal Lace came about because the designer wears medical scrubs during the day, which made it difficult to find a suitable traditional holster. Lethal Lace is a lace wrap that can be worn anywhere on the body in any position – think lacy ACE wrap. There are currently four color options and two size options (less than a 43 inch waist and greater than a 43 inch waist). Since the wrap is so versatile, it can be used to carry almost any size or shape of firearm. There is even an extra pocket than be used for a cell phone or a spare magazine. Price range is $41.99 – $51.99. 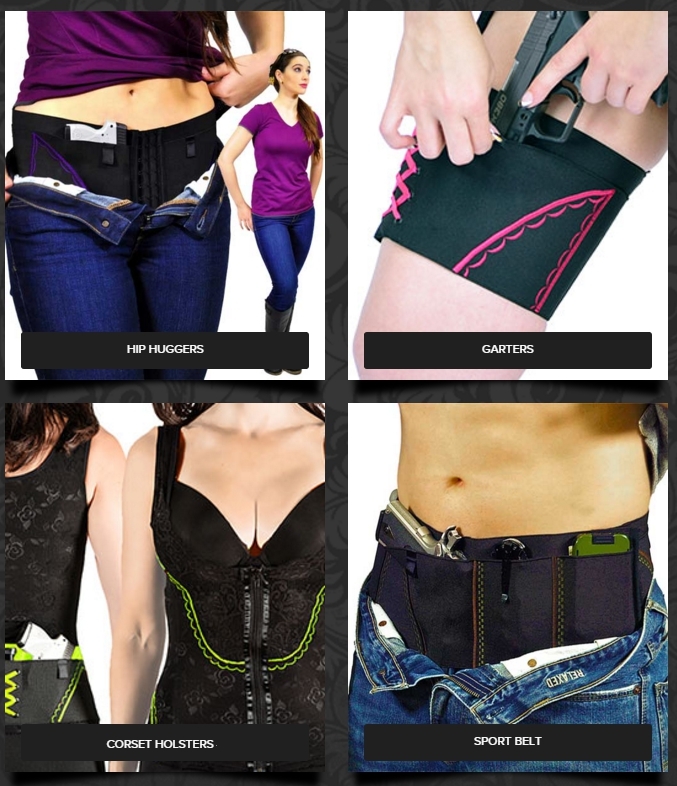 A similar line of lace holsters come from Miss Concealed, who we found in the SHOT Show NEXT section this year, which showcases up-and-coming vendors. There are currently five options to choose from, each of which is an elastic belly band that range in width from three inches to eight inches, accommodating waist sizes from 25 to 53 inches. For those who favor function over fashion – a reasonable expectation for something designed to be condealed under a top – lace-free options are also available. Regardless of width or design, all models utilize Velcro to keep the band in place. The pocket meant for the weapon has extra padding and is moisture proof to protect your CCW from corrosion. These wraps allow for the carrying of a variety of of pistol sizes provided that the overall length is compatible with the width of the band. Prices range from $22.00 – $38.99. All holsters are assembled in the USA, but not all are made entirely in the USA. Another offering in the world of elastic bands intended to hold a firearm in place is from CanCan Concealment. All CanCan holsters are hand made in the USA using what company personnel describe as “military grade” elastic. Four styles of holsters are available, each offered in three sizes: 4”, 5” or 6” width and in four colors. All CanCans use hook and eye closures, rather than Velcro, with extension available separately. Price ranges from $66 – $105, depending on size and style. For those with a creative side or specific preferences, custom orders are accepted for other colors, sizes, Velcro, or pocket design. 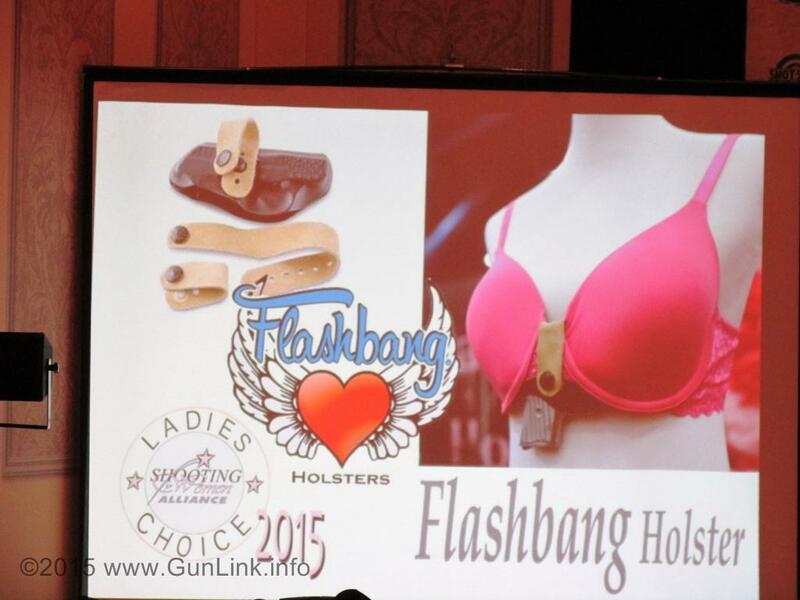 The standout offering among women’s holsters is the award-winning Flashbang, whose original offering was a holster designed to fit on the front of a bra – although they have since expanded their line to include a variety of holster styles. Due to the placement, full size weapons are not typically supported. The entire line of Flashbang holsters are customizable by color and draw hand. Flashbang offers a total of six holsters meant for women, providing for carry under the bra, at the side of the bra, or at the waist. Price ranges from $49.99 to $59. 99. With any holster, it is important to practice drawing from concealment and these offerings are no different. While practicing your draw, be sure to practice the four rules of gun safety. You should begin by practicing your draw with a firearm that you are absolutely certain is unloaded until you are comfortable with the mechanics of drawing from the holster you are using. Once comfortable, you may wish to practice drawing and firing, in which case you can do so safely – although many ranges do not allow this practice. These are just a few of the options available that may make carrying concealed easier for women. If you know of others that work well for you, feel free to share them in the comments section below.